How often do you need a multimeter? If you are like most people who like to handle their own projects around the house, those occasions are probably rare. The fact is though that at some point you will need one. 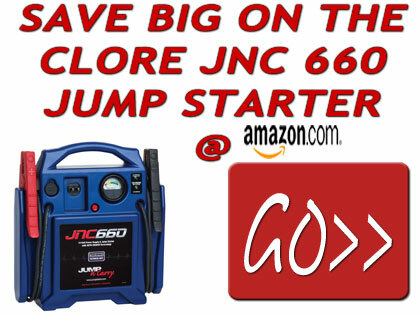 This article will explain why they are so useful and also your best choice for purchasing a multimeter. What is a multimeter? According to Wikipedia, a multimeter is an electronic measuring instrument combines several measurement functions in one unit. These can include voltage, current and resistance. They can also range from small handheld units to large, bench mounted units. The benefit of owning a multimeter is in it’s name: multi. What this means is that it can be used in the home as well as for diagnosing electrical problems with your automobile, boat, motorcycle, atv, etc. There is nothing worse than being in the middle of a project and finding out you have the wrong tool. What are the benefits of the INNOVA 3320? 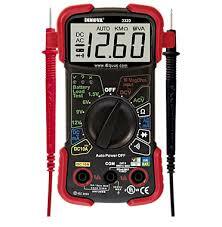 There are several important features contained within the multimeter. With Auto-ranging, you no longer need to dial in the correct range to begin measurements. This saves time and frustration. I love the huge display. I always seem to end up upside down with the meter in a bad spot. Now I can always see what the meter reads. The protective casing will save you from buying a new meter. Trust me on that one! This is a good little meter.Thumb uppers: Small overall size, large LCD display, auto-ranging, uses 2 AA batteries, uses standard sized banana plugs so is compatible with several 3rd party or customized probes/connectors.Thumb downers: probe clips are such weak, soft rubber that they don’t grip the probes securely. And it would be nice for a little more $$ to include a case. So instead buy a $3 camera case to solve both deficiencies. Too bad the over-sized instruction booklet isn’t the same size as the meter so it can be stored in the same case. This little meter is outstanding! I own a Fluke DMM 179 and of course that meter is top of the line. But would you believe this Equus 3320 is 99% spot on with it’s readings when compared to a recently calibrated Fluke 179!! I compared measurements with the Equus 3320 and the Fluke 179, in AC Voltage, DC Voltage, Resistance, and DC voltage for the Equus in the Battery test modes. It had literally almost identical readings to the Fluke! The circuit board appears to use mostly prime spec electrical components, so I suspect it will remain accurate for a long time as long as it’s not abused.This meter sells on Amazon for less than $20, and has auto ranging. This means instead of having to dial in the max value manually the meter figures out what DCV range to use (if you were measuring DC voltage for example). It’s the same deal for other measurements like resistance, AC Voltage, etc, just set to that measurement type and the meter figures out the correct max range. Most auto ranging meters below $99 have slow auto ranging acquisition speed (this is the time it takes for the meter to figure out what range to use). Many of the cheaper auto ranging meters take several seconds to figure out the correct range and then display the measurement. Not the $19 Equus 3320, it was just as fast as the Fluke 179, which is a second or less in the voltage measurements, and under 2 seconds for resistance (resistance auto ranging takes slightly longer on all meters because the meter must send a small amount of current across the device under test first before trying to acquire the range).The battery test function (which my Fluke 179 does not have) is the main reason I purchased this meter.